"Walter Walsh, proprietor of Town Taxi which was located at the corner of Main and Mechanic (Princess) Streets, found that he didn't have enough gasoline coupons to keep all his motor-driven taxis on the road all the time. Faced with the possibility that gasoline for taxicabs would be cut-off altogether during World War II, Walsh purchased a 'smart stepping horse' and an old-time depot carriage to carry his customers. 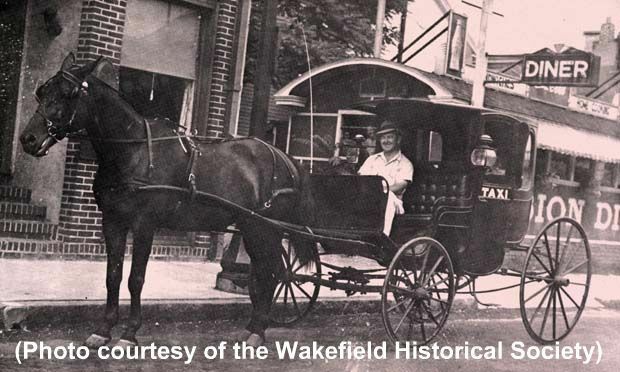 The horse-drawn carriage was used to supplement his fleet of automobiles, but it was reported that many Wakefield patrons passed up the opportunity to ride in the cars when offered a choice. The carriage was an enclosed four-wheeler, allowing the two passengers to remain dry in the event of inclement weather." -- Text from calendar by Jayne M. D'Onofrio. “Town taxi, summer, 1943,” NOBLE Digital Heritage, accessed April 22, 2019, https://digitalheritage.noblenet.org/noble/items/show/7104.